The Journal’s description of Deborah’s professional expertise is copied below. 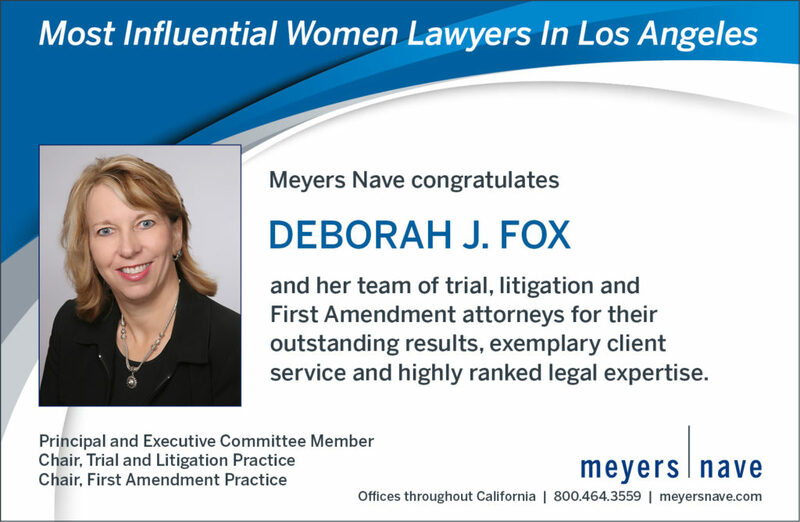 Deborah Fox is a Principal in the Los Angeles office of Meyers Nave. She is a member of the firm’s three-person Executive Committee. She founded, built and leads two of the firm’s most prominent statewide practices – its Trial and Litigation practice and its First Amendment practice. Fox’s cases frequently involve issues that attract intense media attention and public scrutiny, including matters of first impression. She is well known for handling matters that are already front-page news or likely to become a headline as the case unfolds and after it concludes. Fox’s complex litigation experience includes multi-party and multi-district cases, civil litigations that are intertwined with pending criminal actions, and matters that require managing, researching, reviewing and interpreting extensive electronic information. She is selected by government entities, such as cities, counties and special districts, to handle their highest profile, most complex and often most controversial litigation matters.